Mumbai, April 14: Despite giving a Deputy Prime Minister, a Lok Sabha Speaker, several Union Ministers, four Maharashtra Chief Ministers and a Deputy Chief Minister, the Marathwada region of Maharashtra remains the most backward in the state. 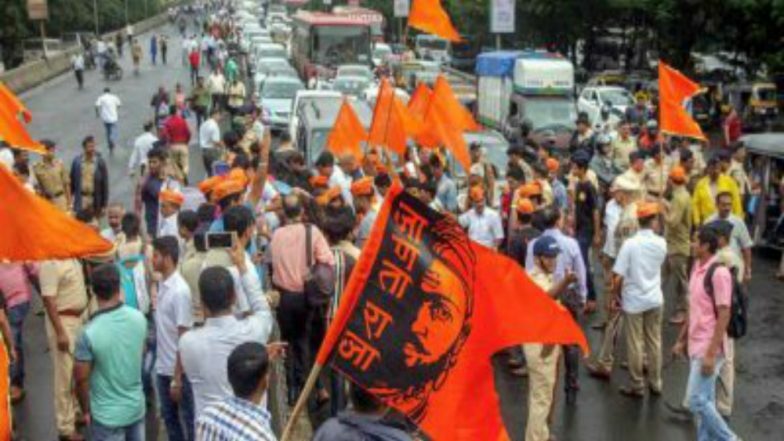 As the eight Lok Sabha constituencies - Beed, Hingoli, Jalna, Latur, Nanded, Osmanabad, Parbhani - go to polls on April 18 and Aurangabad (April 23) - the dominant Marathas of the region - strain their eyes for the promised development of their lands that has eluded them since the country's Independence in 1947. Maratha Caste Certificate For Reservation: How to Apply For Caste Certificate Online; Forms and Documents Required – Check Here. Besides, the region is plagued by consistent drought due to scanty rains, insufficient irrigation facilities and lack of water for both humans and animals, problems of unemployment and absence of any major industries. One of the reasons is that the powerful political lobbies from adjoining Western Maharashtra dominated over the Marathwada leaders and most chose to succumb instead of fighting back, leaving the area neglected for years. "Even the powerful Chief Minister Vilasrao Deshmukh could barely grapple with the Western Maharashtra chieftains and do little for his native region. As a consequence, all major industries, domestic or foreign investments and jobs kept going to Western Maharashtra," said veteran political commentator A. Shaikh of Aurangabad. Ditto with the father-son Chief Minister duo - the late Shankarrao B. Chavan and Ashok Chavan, or the first Chief Minister Yeshwantrao B. Chavan who later went onto become India's Deputy Prime Minister, and also the late Gopinath Munde, a former Deputy Chief Minister and Union Minister. Against this backdrop, the contest in Nanded - a Congress bastion which it has won 12 times - will be a keen one between Congress' Ashok Chavan and BJP's veteran legislator Pratap Chikhalikar. This was also one of the 'safe seats' being considered for Congress President Rahul Gandhi (who later selected Wayanad in Kerala) besides his traditional Amethi. Along with Nanded, Hingoli was one of the two seats which weathered the 'Modi wave' of 2014 and elected Congress' Rajeev S. Satav, though by a thin margin of around 1,600 votes. This time, Satav opted out for party work and Congress has nominated former Shiv Sainik Subhash Wankhede, who is pitted against the Shiv Senas Hemant Patil. In Beed, BJP's Pritam Gopinath Munde won in 2014 in a by-election after her father's death, by 696,321, highest ever victory margin in India, where she's pitted against Nationalist Congress Party's Bajrang M. Sonawane. This time, curiously, a NDA ally, Shiv Sangram Party's MLC Vinayak Mete, has decided to support NCP's Sonawane, ostensibly since Pritam and her sister, state minister Pankaja Munde had insulted him (Mete) several times in the past few years. Jalna is another BJP bastion where sitting MP Raosaheb Danve-Patil, the state party President, will lock horns with Congress' Vilas K. Autade, but BJP activists claim "there's no fight in Jalna and Beed". An important contest is lined up in Osmanabad where two cousins from bitter rival political families are pitted against each other - the Shiv Sena's Omraje Nimbalkar and the NCP's Ranajagjitsinh Patil. The Sena may face a tough time as it dropped its sitting MP Ravind Gaikwad, famed for attacking an Air India staffer with a chappal. The erstwhile bastion of the late Vilasrao Deshmukh, which earlier elected former Lok Sabha Speaker Shivraj V. Patil seven times, Latur is currently held by the BJP' Sunil B. Gaikwad. But the BJP dropped him and nominated Sudhakar T. Shrungare, who is pitted against Congress' Machhindra Kamant, who recently quit the NCP. There's Parbhani, a Shiv Sena bastion since 1989, except between 1998-1999, when it reverted to the Congress. The Sena has repeated Sanjay H. Jadhav, who is pitted against NCP's Rajesh U. Vitekar and the Communist Party of India's Rajan R. Kshirsagar. Jadhav faced a huge embarrassment when the Parbhani District Election Officer ruled that all articles on him published in five newspapers should be treated as 'Paid News' and be accounted for in his election expenditure statement. Going to polls in the third phase on April 23, Aurangabad - a Muslim-dominated city - is another Sena stronghold where sitting MP Chandrakant Khaire has been winning since 1999. This time, he's pitted against Congress veteran Subhash Zambad and the VBA-AIMIM nominee and local legislator Imtiyaz Jaleel. Earlier only once - in 1980 - was a Muslim, Qazi Saleem of the Congress was elected to Lok Sabha from here. Though backward, Marathwada is at the domestic and global forefront renowned for the World Heritage Ajanta and Ellora Caves in Aurangabad and Pathri village in Parbhani, which is the birth-place of the famous saint Saibaba of Shirdi. After the Golden Temple, it's the top pilgrimage centre for Sikhs with the Hazur Sahib Nanded Gurudwara; three of 12 Jyotirlings are in Aurangabad, Beed and neighbouring Nashik; the Bibi Ka Maqbara or mini-Taj Mahal; the Daulatabad Fort; Emperor Aurangzeb's tomb in Khuldabad; and the mausoleum of Sufi Saint Zar Zari Zarbaksh or Shah Muntajabuddin, ar all in Aurangabad. The Sayed Shah Turabul Haq Dargah is in Parbhani, among many others.